It is a pain to gather all this information in one place, I know. But I also know how easy it is to reference the sheet quickly once it's created. All this information in one place is a great asset to your preparedness. Electronic: Now that you have the information in a fancy Word Document, where do you store it? Electronic copies are great, but electronics can fail. Also store the information on multiple hard drives: your computer, USB thumb drive, back-up hard drive. Hard copy: Paper copies are also important, if you can't get power for your devices. 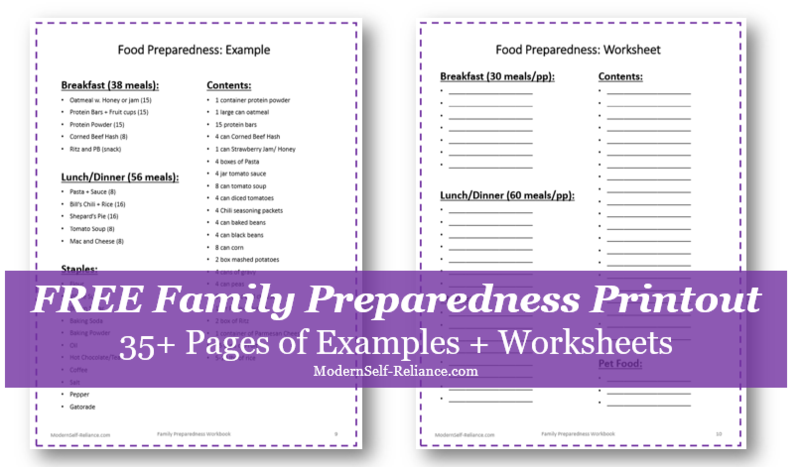 Keep a family binder with this important information in one handy place. I also keep a copy in my 72-Hr bag so I can grab and go. What else do you keep in your family binder or reference sheet? Let us know below in the comments. Stainless steel pot: Cheese-making is intentionally using live enzymes to break apart the cheese. We don't want any wild bacteria growing in this cheese, so stainless steel is the way to go! Strainer: We will need to strain the cheese from the whey. Long knife or spatula: We will need to cut the cheese all the way to the bottom of the pot, so it needs to be long enough for that. Dissolve the citric acid powder in 1/4 cup of water in your stainless steel pot. 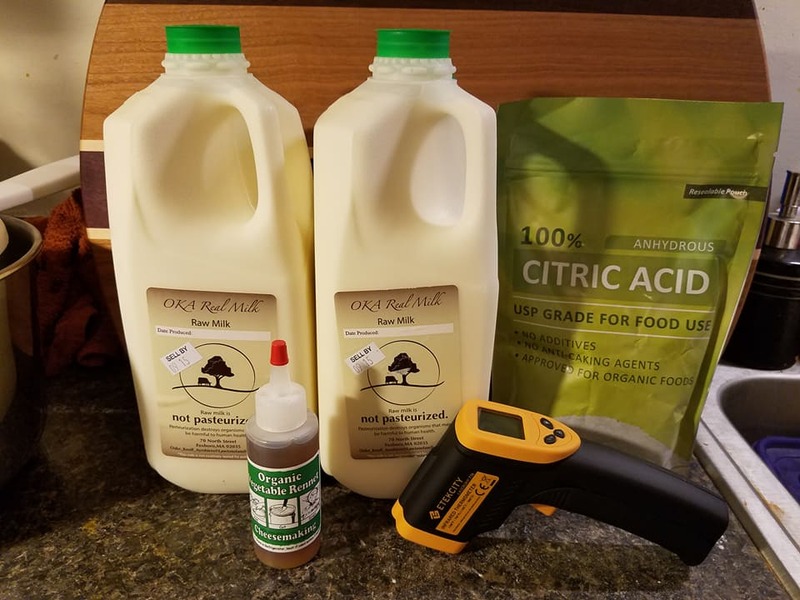 Pour the milk into the citric acid solution and stir it to combine. Put the pot over medium-low heat and heat it to 90 degrees (with your laser thermometer.) When the milk reaches 90 degrees, remove the pan from the burner and pour in the rennet mixed with water. Stir the mixture with a gently for 30 seconds. Let it come to a rest and walk away for 5 minutes. After the five minutes, the mixture should be like very soft custard. With your long knife or cake spatula cut the cheese in a grid pattern. No points of straight lines, we are just cutting up the curds to make them easier to stir. Return the pot to medium heat and stir gently until the temperature of the liquid whey reaches 105 degrees. 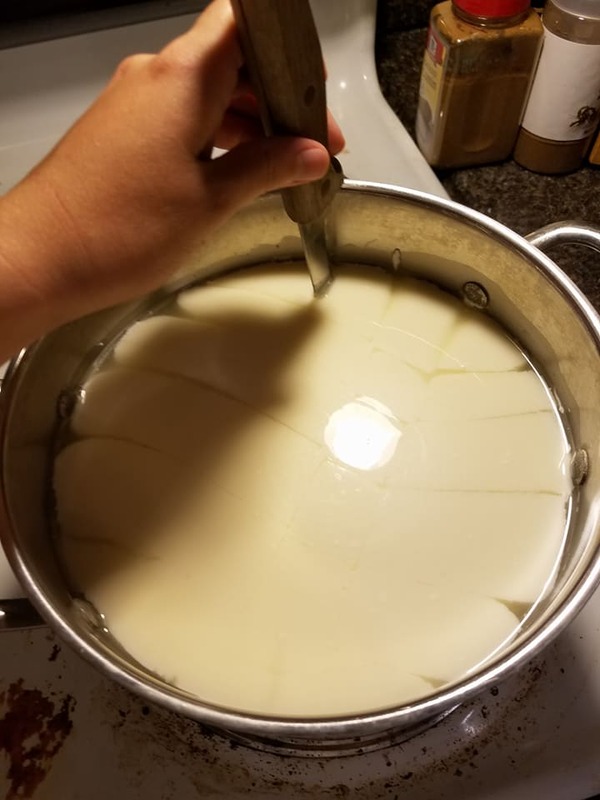 The whey (liquid) should start to be distinct from the curds (cheese). 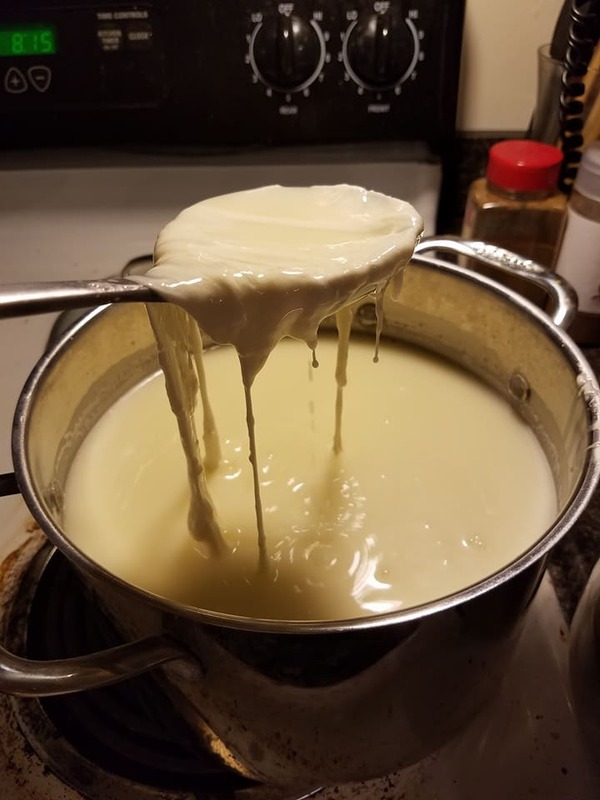 At this point, there is two main ways to stretch the cheese to form the stringy mozzarella texture and remove the excess whey. You can use the microwave or your can use a pot of hot water on the stove. Basically you want to heat the cheese so it starts to melt and stretch it. You want to squeeze off as much whey as you can. When you have finished stretching, we will add salt and form into a nice ball. Then transfer the cheese to a microwave-safe bowl and microwave the curd on high for 1 minute. Remove the bowl from the microwave and pour off as much whey as you can. Press the curd together with your hands and again drain off the whey that comes out. Microwave it again on high for 35 seconds, the press the curd together again to drain the whey. Knead and stretch the curd a bit to drain more whey, then microwave it one last time for 35 seconds. Draw the cheese from the water and begin to stretch the cheese and fold it back over itself. If it starts to get hard to work with, put it back in the hot water to soften. Press the cheese together to drain out as much excess water as the cheese comes out of the pot. Repeat twice as desired to create that stringy mozzarella texture. As you cheese it stretched now, by either method, and you have removed as much of the whey as you can. Now is time to salt the cheese and form it into it's final shape. The secret is in the salt. Knead in the salt and roll it under itself until it forms a neat ball. Then set the ball into an ice water bath and let it rest in there until totally cool. Store in brine: Make a salt-water brine to store your cheese in. This will prevent the cheese from drying out and add extra salt. Store in container: Leave your mozzarella in a sealed container with no other liquids. This will keep your cheese fresh, but it may harden or dry out slightly. Don't bother storing it, just eat it right away. I mean, this is always an option. 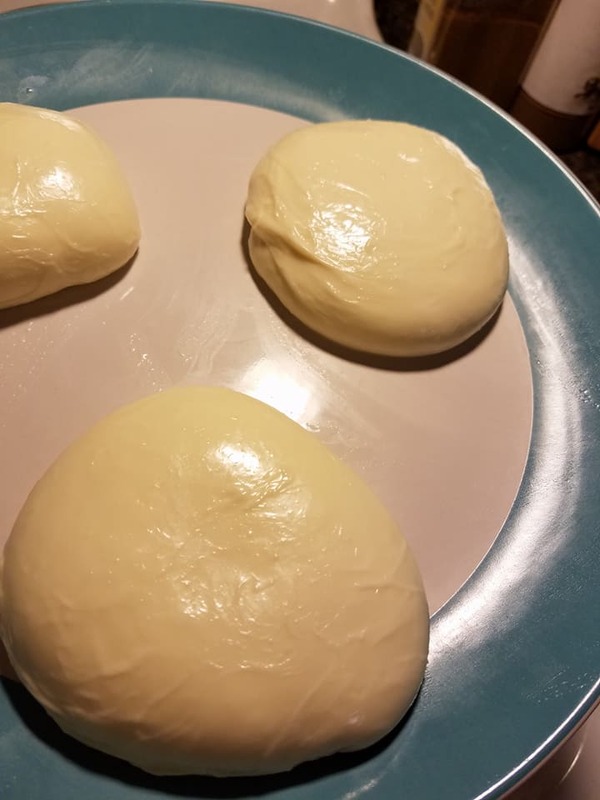 Have you ever tried to make your own cheese? Share your story in the comments below. 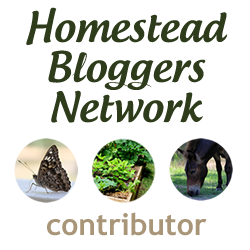 Traditionally the concept of Bugging-out means one leaving their home for a safer, usually more rural location in order to escape a natural disaster or social unrest. People talk about their Bug-Out location, usually a rural cabin stocked with food and guns. They will bring their Bug-Out bag, usually similar to a 72-hr bag or a ultra-light backpacker's bag. They could plan to reach a cabin or just a secluded spot and pitch a tent. The problem I see with Bugging-Out for city-dwellers, is that for most people, it's just not possible or feasible to own a bug-out location. For residents of major cities, millions of people can't leave their apartments and homes for the countryside. The countryside can't support that many people, the national forests can't support that many people and rural communities do not want nor can accommodate city folks sleeping on their lawns. It doesn't seem feasible for millions of urban and suburban residents to leave town, even if a large scale disaster is on the way. People here will have to learn to Bug-In and hunker down or find an alternative location in another city. I will not attempt to recommend a solution that will work for everyone. It is just too hard to find one perfect solution, and it must be tailored to your needs and your family. Your car, if large enough for your family, could provide mobile water-proof coverage from the elements. As you, and likely many others, plan to evacuate an area, highways may become clogged. Your vehicle will become your home base as you travel to a safer place. Even if you don't plan to stay in your car, pack it as if you won't reach your intended destination. Before the disaster hits, prepared your car for a trip now. You may have advance warning for a hurricane or snow storm, but when it comes to actually leaving, your exit may be unexpected. Here are some generic car items that are good to have for day to day trips around town (35 Items You Need To Put in Your Car Right Now). This list recommends the basics: food, water, first aid, spare tire, jumper cables, blankets, change of clothes and flashlights, along with other items. Find a friend or relative with a high rise apartment. This may provide protection from flooding or civil unrest in the streets. While high rise apartments come with their own hazards like electrical fires, they also can raise you away from the street. There have been cases where flooding causes electrical shorts that can cause fires. Also, sewage backup is always a potential with flooding. But for cases of civil unrest, being on the fourth floor puts over forty feet between you and riots below. But please don't show up un-annouced. Plan ahead with your high-rise living friend if they are willing to accommodate your family. Bring your own supplies with you like bedding, food, and water if you are able. Talk to your friends and relatives about the advantages of their homes for various situations. While it may not be possible to get into a completely rural community, having the option to retreat to a more suburban house may have benefits. Perhaps even store survival items you would want at their house, so there is less to carry when you do need to evacuate. Share your home's advantages with them. It may happen in other situations, your home may be better for your friends or family. Friendship is a two-way street. Store some survival supplies at their house but host their box at your home. This could double as a fire insurance box, if you house is destroyed you would have a change of clothes at your friends house. In return you could host a box of theirs at your apartment or home, and make a plan if your house is a better option for them. Try finding a motel in a different city. While many don't take pets, and will become booked quickly. It may be worth it to find a room to live out of in another city. Motels could also provide a stop over point to a further destination. We still recommend bringing the same supplies as you would for any of the above options. The motel could also lose power or running water. Try not to let others around you see the supplies in your car. You packed your car with supplies and evacuated like many others. Don't make your car a target by leaving food, water, or other supplies in view. Throw blankets over your supplies, much like you would hide your purse under the seat in the the sketchy city neighborhoods. I only recommend this option for people who already go camping in tents or at campgrounds. While it may seem like a good idea to camp out for awhile in a rural place, they are often crowded with one site right next to another. Camping in this manner also requires gear and skills, like camp cooking and sanitation practices. If you have never camped out, during a crisis in not the time to learn. If you have an RV or camper, campgrounds may be the natural first option for escaping the situation. To learn these skills, try taking the family on a trip for a weekend during the summer. This will give you an idea if this solution would work for your family. Those in wheelchairs or who have other dependents, may find this option unavailable to them. Of course, if it's your last option, make do with what you have. We believe that if everyone was a bit more prepared, the community as a whole would be stronger. If you have relatives who live further away or in a remote cabin, bugging-out to that house may seem like the best option. Of course, ask your relatives if they are willing to host you if things get rough. Don't assume you can show up at Uncle Tony's cabin in the middle of a snow storm because your city apartment lost heat. Have you ever had to evacuate? Share your story in the comments below.